Sometimes it’s hard to decide or know what type of food to bring to a party, especially a birthday potluck party. Thanks to Pinterest! The scratching-your-head day is gone. I couldn’t be more happier to have found this recipe. Of course, it involves alcohol. You can’t go wrong for bringing alcohol to a party. Well, it’s not a party if it doesn’t involve alcohol. Right?! But you don’t want your friends to be wasted either. This recipe is perfect. Just a little of bubbly. Just a little of romantic. Just a little of prettiness. And not to mention, it’s A LOT of DELICIOUSNESS!! Bring it to your next party and your guests will be wowed. Bring the water with the gelatin powder to a boil over high heat while stirring until the gelatin is fully dissolved. Remove from the heat. Transfer the gelatin mixture to a bowl, add the sugar, and stir until dissolved. Then, stir in the champagne and ginger ale. Refrigerate until thickened a bit. Make sure the mixture is still partially liquid. Fold in the strawberries. Spoon into 7 to 10 individual molds or a big mold. The smaller the mold the firmer the jello will be. Remember, metal mold acquire firmer jello than glass mold. Refrigerate until firm. Unmold and serve. 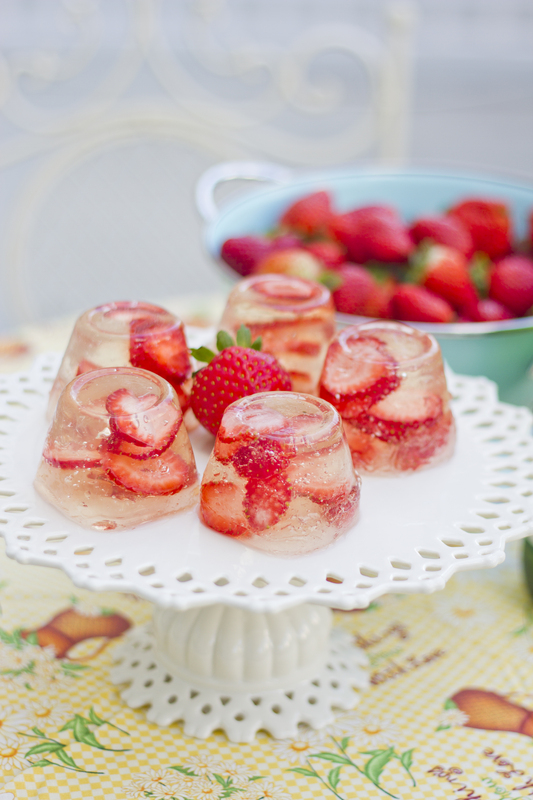 To unmold, run a knife around the top of the jello and put it in a bath of warm water for 10 – 20 seconds. Flip it over and shake it or give it a light pat. Make some of these for your loved ones on Valentine’s Day and they will be swooned away and in cloud 9. This entry was posted in Dessert, Food & Drink and tagged champagne, Dessert, Food & Drink, food photography, jello, jello shot, New Year's Eve Celebration, party, strawberry, Valentine's Day. Bookmark the permalink. My 4yr grdson love’s ideas such as , So we r using 100% fruit juice. Can you make these like a week or n advance? Making them for my 60 th birthday garden party! I would not suggest a week but a day or 2 ahead is alright. Making them for my 60th birthday, garden party! So fun can you make these a week in advance and keep them in refrigerator? I remember mine would turn a bit watery when made fridge it for a week. The taste might not be as fresh as it is made a day ahead. I made them and LOVE them, just the way they are Thank you, so much! Just Wondering if I could add a little vodka to make a bit a bit stronger in alcohol, or less gingerale? Although I love them the way they are! Of course, you could replace some of the liquid called for ginger ale of champagne with vodka. Try it and sure let me know how you like it. I tried making these and they never set. What is meant by 3 tablespoons OR 3 envelops of gelatin powder. 3 envelops is a lot more then 3 tablespoons. Help. Normally, the gelatin sells in stores is in individual envelope with about 2 or 3 in a box. Each envelop is about a tablespoon. omg, I LOVE these, made for my 50th bday tomorrow, after the first ones set, I tried one, OMG I made more lol cant wait for everyone to taste them! I did them in jello shot cups, they came out fine, thanks for sharing! Happy Birthday, Melissa!!! Have a jelly belly one! why do you need to add Sugar? shouldn’t the ginger ale, alcohol, and gelatin have enough sugar? don’t like a lot of sugar. Me neither. I also don’t like the bitterness of the alcohol too. 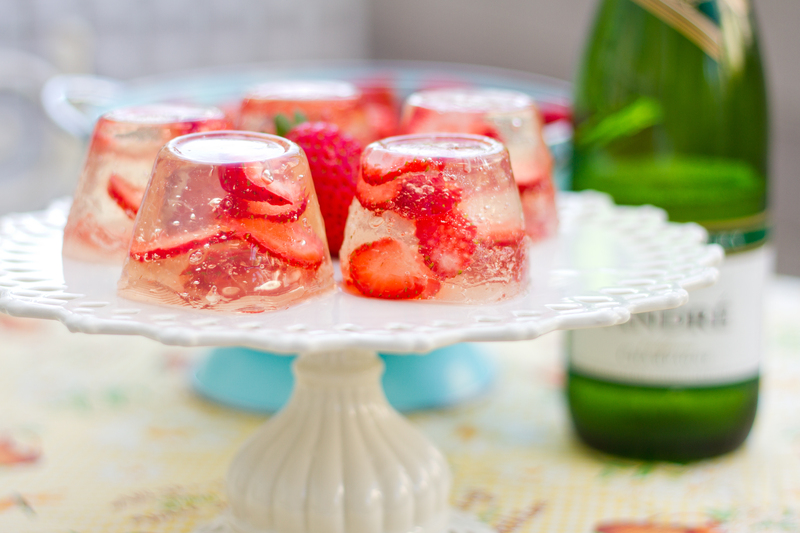 Gelatin doesn’t have sugar and the sugar in ginger ale is not enough to sweeten the dessert. 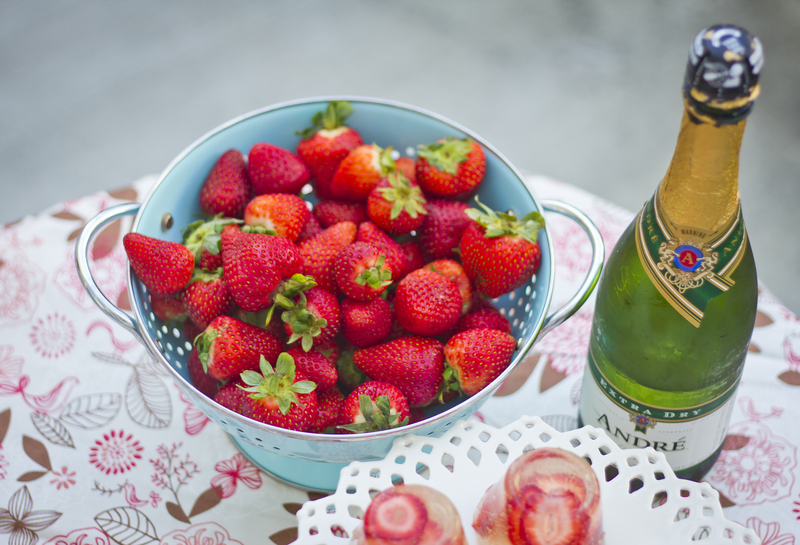 Without the added sugar, it might taste a bit alcohol-ish and not like a dessert 🙂 But if you like to taste more of the champagne, then you could omit or put less sugar. Always able to adjust to your own taste and diet preference. Im gonna make it, but could you tell me what is the size of your molds? I made these for New Year’s Eve and they were delicious! Funny story though, I thought these were sort of meant to be like jello “shots,” and when I saw that this made 7-10 servings I decided to quadruple the recipe so that I’d have ~40 shots. I failed to notice that this recipe is more for a single-serving dessert, rather than a small shot (if I had taken the time to look at the recipe quantities and actually think about it for two seconds I’m sure I could have figured it out). So even after I filled up all 40 shot cups, I still had a massive mixing bowl full of champagne jello! Which is still in my fridge. And I’m considering eating it for dinner. Thanks for the fun recipe, cheers!